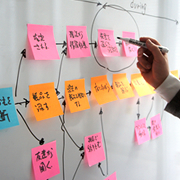 Clarify user priorities by visualizing persona/user journey along timeline. Illustrate activities, emotions, modes, interactions with people/objects/environment, and the factors which promote or inhibit such variables. Clarify the flow of communications from the user point of view. Facilitate the review and decision contents and timing, tone, and manner in order to provide consistent user communications. Clarify role and positioning of touch point services and tools from the user perspective for identifying which touch points should be prioritized and for what reasons.